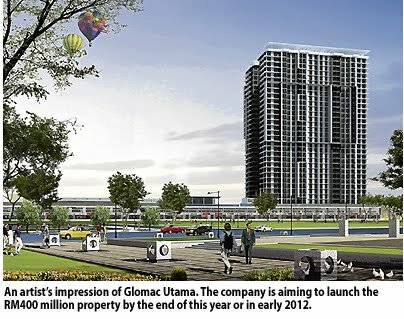 CYBERJAYA: Glomac Bhd, unfazed by the slowdown in global economy, will continue to expand its property development activities in Malaysia. The company is looking to increase its projects in hand to improve earnings, said its assistant general manager, group corporate communication and marketing, Fara Eliza FD Mansor. 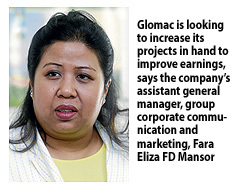 As at July 31, Glomac has a net cash position of RM361.6 million. "We are increasing our landbank size and plan to launch more medium- to high-end developments. We will go where the market is," she told Business Times in an interview recently. The company has close to 405 hectares in its pocket with a potential to develop properties worth RM3.8 billion over the next seven years. Glomac's net profit rose 14.7 per cent to RM17.9 million in the first quarter ended July 31, mainly attributed to strong contribution from previous and ongoing projects. Revenue for the quarter surged to RM127.83 million, from RM126.31 million a year ago. Glomac is currently focusing on four projects, namely Glomac Damansara, Mutiara Damansara Residences and Glomac Utama in Petaling Jaya, Selangor, and Glomac Cyberjaya. The projects are worth close to RM2 billion combined. While the RM1 billion Glomac Damansara has started, the company is aiming to launch the RM250 million Mutiara Damansara Residences and RM400 million Glomac Utama by the end of this year or in early 2012. For Glomac Cyberjaya, the company is now introducing phase two, comprising 55 units of three to 41/2-storey shop offices worth RM250 million. "Phase 1, consisting of 63 units of shop offices, was sold out within six months. There is still a lot of demand for the properties," Fara said. She said the limelight for 2012 will be a yet-to-be-named project in Puchong, comprising mainly residential, valued at around RM1 billion. "That will be our next flagship project after Glomac Damansara," Fara said. Glomac had acquired 80ha of leasehold land in Bandar Metro Puchong for RM77 million this year to undertake the development. Deplorable: The dilapidated longhouses in PJS1 near Old Klang Road is located on a rubbish-dumping ground. There is also a drain which has been clogged and now a mosquito-breeding ground. SELANGOR Mentri Besar Tan Sri Khalid Ibrahim said the woes of the 276 longhouse residents in PJS1 near Old Klang Road will be resolved soon. He said a meeting with the residents would be held in a week to explain the state’s plan. Khalid said he was confident that the matter would be resolved at that meeting. 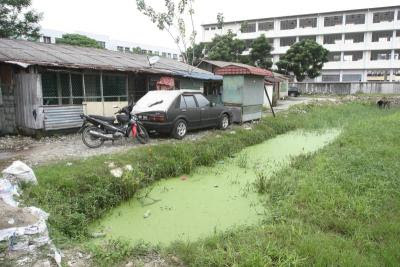 “We have already acquired the property and I think the matter is solved,’’ he said yesterday after attending a green development programme in Shah Alam. Khalid said the matter took a long time to solve because of disputes involving a school and temple. “I am sure we can start the affordable home project for the longhouse residents soon,’’ he said. StarMetro reported yesterday that 276 longhouse residents in PJS1 plan to protest at the office of Khalid if affordable homes are not built in the area. Block E Buyers action committee chairman M. Sugumaran had said they were unhappy with Khalid for not keeping his word to build the homes. Khalid had promised to build affordable homes four months ago after the Selangor State Economic Action Council meeting on June 16. The residents are part of a group of squatters who were moved to PPR Lembah Subang and PJS1 longhouses eight years ago with the offer of low-cost flats. The flats have not been built. IOI Corporation Bhd and Dutaland Bhd have agreed to mutually rescind the sale and purchase agreement (SPA) for the proposed acquisition of 11,977.91ha of oil palm plantation land for RM830 million. IOI said its unit Sri Mayvin Plantation Sdn Bhd and Dutaland's Pertama Land and Development Sdn Bhd had entered into a deed of rescission with immediate effect in a move to resolve all issues and disputes relating to the SPA. "The parties are released from all obligations and liabilities in connection with the SPA and neither party shall have any further claim against the other in respect thereto," it said in a filing to Bursa Malaysia today. IOI said following from the execution of the deed of rescission, OSK Trustees Bhd, the stakeholder jointly appointed by the parties, will proceed to refund the RM83 million deposit earlier paid by Sri Mayvin together with all interest accrued to Sri Mayvin. In a separate statement, Dutaland said the rescission is not expected to have a material effect on the earnings, net assets and gearing of the company for the financial year ending June 30, 2012. Dutaland said it would continue to manage the properties to generate positive returns. GUOCOLAND (Malaysia) Bhd wants to buy PJ City Development Sdn Bhd from GuoLine Asset Sdn Bhd for RM29.8 million. The acquisition will be financed wholly from borrowings, the company said yesterday. Hong Leong Bank Bhd's Tan Sri Quek Leng Chan owns an indirect 65 per cent stake in GuocoLand. PJ City owns two parcels of land in Petaling Jaya, one commercial and another industrial. GuocoLand will convene an extraordinary general meeting to get shareholders approval for the acquisition. PETALING JAYA: Guocoland (M) Bhd has proposed to acquire PJ City Development Sdn Bhd for RM29.79mil cash. It told Bursa Malaysia yesterday that the exercise involved the acquisition of five million shares in PJ City from GuoLine Asset Sdn Bhd. Guocoland also announced that it had proposed to acquire PJ Corp Park Sdn Bhd from MPI Holdings Sdn Bhd for RM258,000 cash. PJ Corp owns two units of low-cost houses in Masai, Johor. Kuala Lumpur: The high-speed rail system linking Kuala Lumpur and Singapore could take shape by next year, with three groups leading the early race to win the multi-billion ringgit job, people familiar with the plan said. The Land Public Transport Commission (SPAD) is expected to start a feasibility study on the project early next year. The commission had already completed a pre-feasibility study, SPAD chief development officer Azmi Abdul Aziz told Business Times. SPAD will undertake a feasibility study next, which should take six to 12 months to complete, Azmi added. If feasible, the project is estimated to cost as much as RM12 billion, with the interested parties offering either European or Chinese technologies. It is believed that up-and-coming rail tycoon Tan Sri Ravindran Menon has teamed up with UEM Group to vie for the project. Ravindran controls Skypark Terminal, which recently received an offer from the government to undertake a RM1.5 billion rail project. The project is to connect the Keretapi Tanah Melayu Bhd (KTMB) station in Subang Jaya, Selangor, to the Skypark Terminal at the Sultan Abdul Aziz Shah Airport. 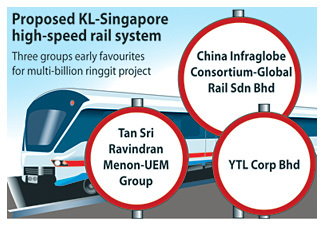 Business Times understands that the Ravindran-UEM venture made a presentation to the government early this year, specifically on the more than 300km high speed rail line. Sources said they planned to lay railway lines parallel to the North-South Expressway from Kuala Lumpur, Seremban and Malacca to Johor Baru, before connecting to Singapore. Others said to be in the running for the job are China Infraglobe Consortium-Global Rail Sdn Bhd and YTL Corp Bhd. China Infraglobe-Global Rail consortium last made a submission for the job in 2009. To date, it has yet to make a revised proposal to the government, a company official said. YTL group managing director Tan Sri Francis Yeoh Sock Ping, who is in New York, declined to comment when asked if the company had made a fresh submission. YTL, operator of the KLIA Express, first mooted the idea to build a high-speed rail in the late 1990s and again in 2006. The project was put on hold in April 2008 due to high cost, which was estimated at RM8 billion. In the middle of 2009, YTL expressed hope that the government would relook at the proposal. It said it would build the rail line on the coastline of Peninsular Malaysia, rather than that mooted in an earlier proposal of building on the existing track. Last year, the government said it would revive the project. It was highligted as a high impact project in the government's Economic Transformation Programme roadmap in a bid to increase economic activities. Yesterday, the government reiterated that it may go ahead with the project. Transport Minister Datuk Seri Kong Cho Ha said it would wait for feedback from its Singaporean counterparts as the track would go into its land. Germany's Siemens had previously offered its solutions to the project. It proposed the use of its Velaro trains, which have a top speed of 350kph. UDA HOLDINGS Bhd had two weeks ago submitted a proposal to Syarikat Prasarana Negara Bhd (SPNB) to jointly develop the Dang Wangi LRT station. The land, measuring 11,008 sq m in Jalan Ampang, is strategically located and has the potential for residential, commercial or mixed development. In a statement, UDA Holdings chairman Datuk Nur Jazlan Mohamed said the group has over 40 years of experience in urban redevelopment and the technical capacity for the proposed joint venture with Syarikat Prasarana to develop the land. iProperty Group, an online property group, has clinched fourth place in the Top 100 Fastest Growing Business by Business Review Weekly (BRW), an Australian business magazine. iProperty generated over AU$7.3 million in the 2010 calendar year and clocked an average growth of 223 per cent over the previous three years, making it the only ASX listed company in the top four. The company also generated over 3.5 million unique visitors and over 45 million page views across the iProperty Group of leading property portals in Indonesia, Hong Kong, Malaysia and Singapore. Its chief executive officer Shaun Di Gregorio said: "This recognition is a tremendous accomplishment to the Group and being part of the list is a testament to our hard work and dedication. "This continued success is a reflection to our commitment to providing highly innovative products to our customers and assist them in searching for their dream home," Di Gregorio said in a statement today. SINGAPORE: Design, Build and Sell Scheme (DBSS) flats have been attracting such strong interest that they now cost nearly as much as executive condominium (EC) units. Their overall median price was now only S$100 to S$150 per sq ft (psf) lower than that of the condo units, said Lee Sze Teck, senior manager of research and consultancy at Dennis Wee Realty. The scheme's popularity comes despite the fact that it is under review, following an outcry when Centrale 8 in Tampines made the news for its high asking prices in July. Lee said the high demand was due mainly to the fact that the projects were located in mature estates, near MRT stations. Prices for Trivelis, the latest DBSS launch in Clementi, were about S$580 to S$728 psf. The cost of new EC flats ranges from S$501 to S$820 psf, according to data that Lee gathered from sources such as the Housing and Development Board and the Urban Redevelopment Authority. “The pricing of DBSS flats has been pushing the boundaries so much that they are now not far off from the prices of new EC projects under development,” he said. DBSS flats, which are built on government land sold to private developers, were introduced in 2005 to provide more choices in the housing market. They have better design and finishes than standard flats, but unlike ECs, they cannot be privatised after 10 years or contain facilities such as pools. Since the scheme was put under review, three projects that were already in the pipeline have been launched and they attracted strong interest. Some had as many as three bidders for every unit. Lee said DBSS properties were attractive also because, unlike resale flats, they required no cash-over-valuation, the premium paid over and above the official value. LONDON: British house prices jumped in October, mortgage lender Halifax said, in a rare sign the housing market may be weathering the economic turbulences better than many fear. Home prices were 1.2% higher than in September, Halifax said. Prices were 1.8% lower in the three months to October compared with the previous year's period. Analysts polled by Reuters had expected a monthly increase of only 0.1% and an annual decline of 2.3%. “The housing market has proved highly resilient in recent months despite the weak economic recovery and the deterioration in the outlook for both the UK and global economies,” said Martin Ellis, Halifax housing economist. Other surveys have painted a bleaker picture and many economists see house prices in Britain falling in the months ahead as the country is teetering on the brink of a recession. Consumers cut back spending as their budgets are squeezed by soaring costs of living, which outweigh small wage increases.